Back in the olden days of law enforcement, even before my time, the rules for the use of deadly force were captured in three words, “Intent, Opportunity, Capability.” By the time I was wearing a badge, this had been replaced by something called the escalation of force model, but all the old-timers (and by old-timers I mean people that were the age I am now) complained about how much simpler the Intent, Opportunity, Capability model was. Ferdaus is accused of planning to use three remote-controlled airplanes measuring from 60-80 inches in length, with explosives packed into each plane. 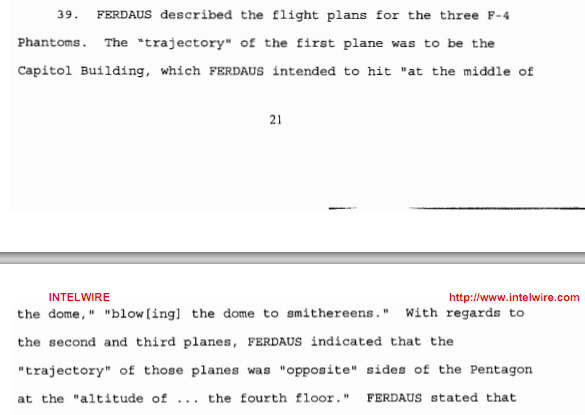 The planes, guided by GPS and capable of speeds greater than 100 m.p.h., would hit the Pentagon and blow the Capitol dome to “smithereens,” according to Ferdaus’ plan, detailed in the affidavit. 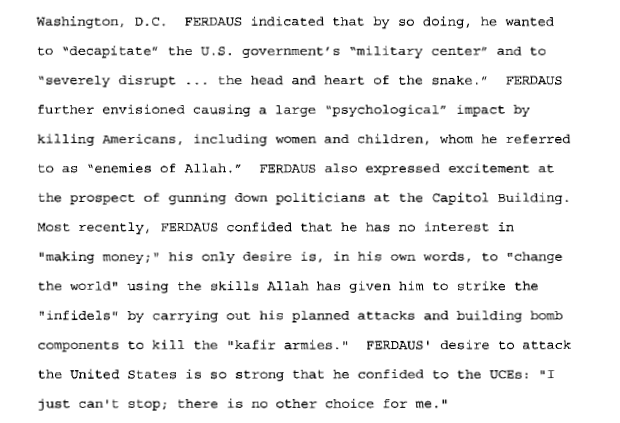 Ferdaus then planned a follow-up automatic weapons attack with six people, according to the affidavit. Sounds pretty serious, huh? The impression you got from most of the reporting today was that the FBI swooped in a the last minute to disrupt this terrorist cell. Jihadist plot foiled, G-Men save the day and America, F@%& Yeah–All rolled into one. Only one problem. Ferdaus was an idiot and there is no way he could have executed any of this. Just for perspective, here is a photo of the one of the planes that Ferdaus planned to use. 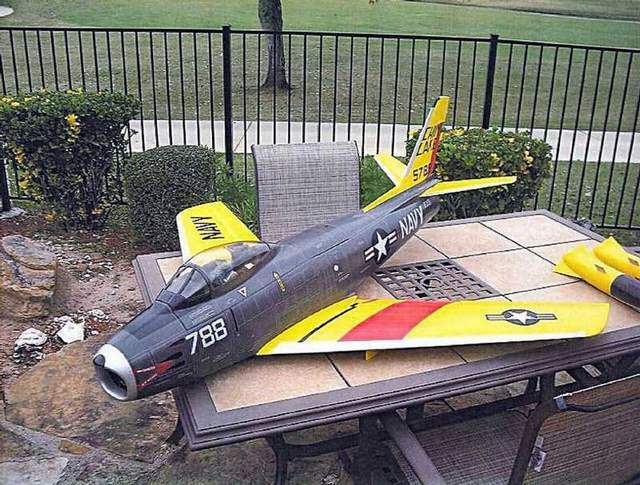 This one is an F-86 Sabre replica, but according to the affidavit it was the same scale as the F-4. Please note that it is perched very comfortably on some patio furniture. Here’s the thing, Ferdaus doesn’t just dream, he dreams big. Not normal human being big, but Jerry Bruckheimer-big. Not only was he going to take down the Capitol Dome *and* destroy the Pentagon, he was simultaneously going to use the remaining 9 pounds of C4 to blow up the bridges surrounding the Pentagon. Then he was going to use his crack team of six al-Qaeda Qaemmandos [If they don’t spell it that way they should] to fire on civilians as they fled the facilities and chaos ensued. Ferdaus had it all planned out. 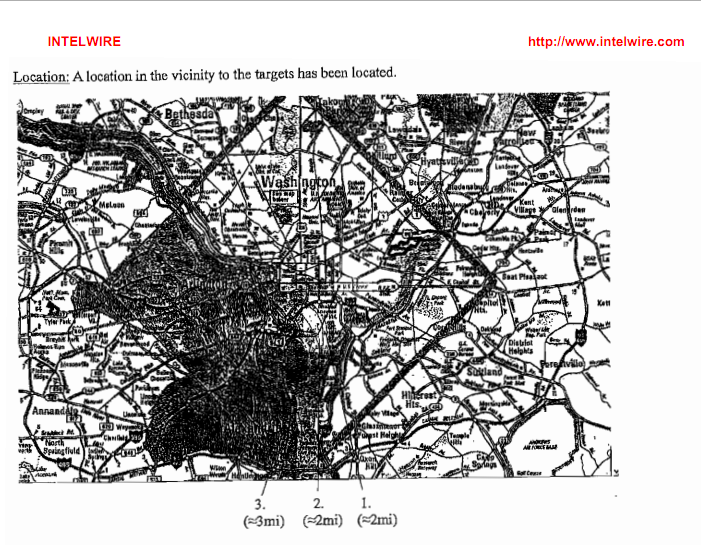 The affidavit even includes a map laying out the precise locations of his targets. Yes, I'm serious. This is actually the map. Ferdaus even knew the perfect place to procure all the materials for his attack. Ferdaus also utilized an alias for procuring all his materials; “Dave Winfield”. I can only assume that this was an homage to Dave Winfield’s epic jihad against Canadian seagulls circa 1983. 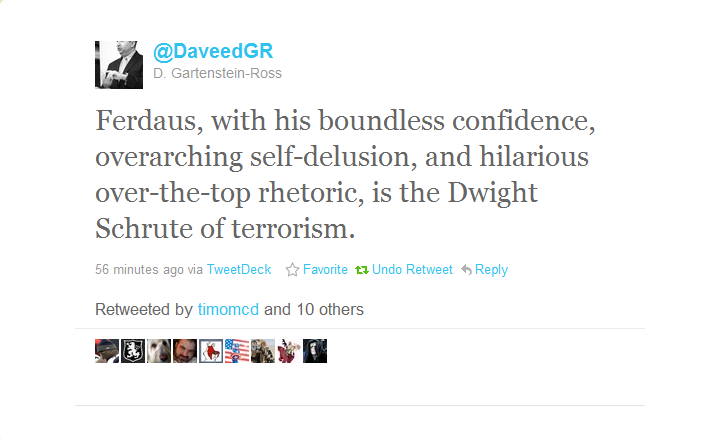 Oh yeah, that 6-man team that he was going to utilize to kill politicians as they fled the fiery wreckage of the Capitol? They didn’t actually exist. Apparently, Ferdaus was the only person involved. The Qaemmandos? They were all undercover FBI or FBI informants. All of the equipment, the aircraft, the AK-47s, the C4, the grenades, all of it was paid for and delivered under the watchful eye of the Federal agents. It was like a weird al-Qaeda version of ‘The Truman Show.’ Everyone knew Rezwan Ferdaus wasn’t a real competent jihadi except him. The impression that you are given from reading the affidavit, is that Rezwan Ferdaus was completely detached from reality and would have had a difficult time managing anything more complex than a paper route. However, while it is certainly fun to mock the delusional aspirations of this guy, the affidavit does have a darker side. In addition to his ridiculous plan to single handedly take down Washington DC, he was also modifying cell phones to be used as IED detonators in Iraq. While the affidavit does not indicate whether or not these would have actually worked, it does state that he demonstrated the devices lighting a small LED when dialed, signifying at least a basic amount of electronics competence. At a minimum, he believed that they would work and even moreso, he believed that they HAD worked. Ferdaus also made chilling statements to the agents over the course of the investigation, such as the last line in this section. So, what do we know? What do we take from this? I’m going to continue to stretch, perhaps beyond breaking, the example I started with. What aspects did Ferdaus actually demonstrate? Intent: Absolutely. Ferdaus clearly intended to cause serious harm and even beyond that when it was “confirmed” to him that his devices had killed soldiers in Iraq, he reveled in it. Despite his poor grasp on physics, geometry, chemistry and cartography it is clear that he intended to harm the US. Opportunity: Yes. Part of living in a free society is that there are very few restrictions placed on individual movement. He was in no way restricted from executing his (completely ridiculous) plan. Capability: Here is the hard one. As you are reading the affidavit, it is very difficult to imagine that Ferdaus would have had the capability to accomplish anything without the assistance of the FBI. Even if he had managed to collect all the components of his plan it seems highly doubtful any aspect of this had a prayer of being successful. Just to be clear, I’m not saying that Ferdaus wasn’t dangerous. If his desires to kill were so easily facilitated by law enforcement, than they could have also been enabled by an organization like al-Qaeda. I’m also, very explicitly, not saying this is a case of entrapment, which is an accusation that has been levied in the past. You have to sympathize with the FBI agents a little. As you read you can sense the places where agents seem to point to the ‘exits’ from the path that Rezwan Ferdas is on. He repeatedly rushes past them. However, even with all of those caveats in place, the fact remains Rezwan Ferdaus was not an imminent threat to the US. This wasn’t a plot that was foiled, it was a delusion that was abruptly ended. With a couple of small variations, Eli Lake’s piece reads like the vast majority of other articles, but look at the oversized quote. This is my concern because this is what we boil the whole story down to. We are Americans, we are incapable of nuance. The entire focus here is on Ferdaus’s intent, because that is what he had in spades and we completely ignore the fact that he had no money, no contacts and no idea how to put his “plan” into action. 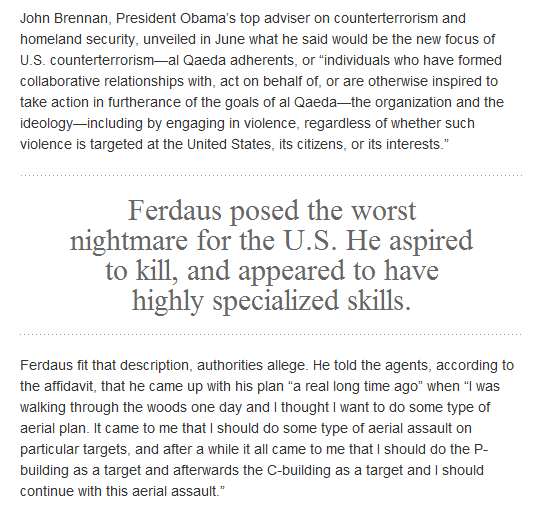 If you read the affidavit, there is no way anyone could refer to Ferdaus as the “worst nightmare” for the US or draw the conclusion that he had any “highly specialized skills.” Ferdaus was more Four Lions than Four Horseman. Why does it matter, whats a little sensationalism among friends? Its important because these things have a feedback loop and at some point, this “plot” is going to become a justification for an additional action that we need to take to combat “terrorism.” That means more resources go into preventing something that was never an actual threat. When we take idiots like Ferdaus, idiots with evil intentions but nothing else, and frame them as existential threats to our way of life than we set ourselves up for a vicious cycle of responding to continuously more ridiculous threats. I’m crossing my fingers that this follow-up story from Milton Valencia (@MiltonValencia) at the Boston Globe gets wider circulation next week. Its looking pretty clear likely that the tip that led to this guys arrest came from his old mosque. The Ashland man who allegedly plotted to fly explosive-laden, remote-controlled airplanes into federal buildings in Washington, D.C., was asked to leave a Roxbury mosque last year because of his radical Islamic views and suspected support of Al Qaeda, a mosque official said yesterday. Rezwan Ferdaus was said to revere the terrorist organization, and he criticized the mosque’s participation in interfaith efforts and in politics. He also disapproved of the mosque’s liberal policies that allowed men and women to eat and drink together in its cafe and was hostile toward women he thought dressed inappropriately or who had conversations with men, the official said. So, the next time you hear someone ask, “Where are all the moderate Muslims?” One of the many places you can point them towards is Ashland, Massachusetts. Read the great comment from ‘The Student’ on the usage of the phrase “moderate Muslim.” I should have outlined my snark more clearly surrounding that phrase. ← The Persians Are Coming! Instead of Paul Revere, We Have Cable News! Great post all around, not least of all because of “Qaemmandos.” But the point I want to touch on is your last one, in the update. I have a problem with this idea of “moderate Muslims” that is often brought up when discussing Islamic extremism. Associations are, by nature, strictly voluntary in America. The idea of a “moderate Muslim” applies a classification rather than acknowledging a self-applied one. No Muslim, other than a terrorist, wants anything to do with murderous, hateful people (whether such people are Muslim or not). “Where are all the moderate Muslims?” people ask, as you note. They’re asking the wrong question. “Where are the crazy Muslims?” is what they, and the FBI, should worry about. Another problem with the “moderate Muslim” label is definition. Does not believing in jihad and murdering innocent people make one a moderate? In that case, shouldn’t we be calling ultra-conservative, right-wing Christians moderate, since they do not espouse holy war or murder either? Does eating pork or drinking alcohol qualify a Muslim for a moderate label, since they clearly are not too concerned with religious rules? Is a strict, pray-5-times-a-day, never-miss-a-day-of-fasting-during-Ramadan, don’t-even-look-at-a-girl-before-marriage Muslim a moderate, or is that a tad bit too conservative? I dislike the moderate Muslim label (at least in America) because it assumes that to be a moderate Muslim is an aberration from the norm, some quasi-conservative status that is ripe to burst into violent fanaticism. Your average Muslim on the street has as much a connection to al-Qaeda or any other jihadist organization as Rick Perry and his “Niggerhead” ranch does to the KKK: zero. At least two people have posed the exact question to me: “So where are all the moderate Muslims?” It makes me want to laugh. Both times I’ve said, “Well, I guess you’re speaking to one.” I never imagined I’d have to think of my identity in terms of NOT wanting to violently kill innocent people. I rarely admit mistakes, but I have made a critical one here. Your comment on the linguistic and logical issues associated with “moderate Muslims” is spot on. Its so accurate that I’m not even going to go back and update the post to put the phrase in “snark quotes” to highlight how it was intended and instead direct people to your comment. There’s no mistake on your part, I’m talking about the same people you are– the kind who ask “Where are the moderate Muslims?” with a straight face. Student i think what gets most people is that we dont see them either beating the hell out of these people or showing some type of public disagreement. I understand most muslims dont agree with this type of thing but when CAIR is the one getting attention all the time saying “this is the fault of american imperialism and we understand his hatred!!!!!!!!!”. Good point, it is unfortunate that organizations like CAIR get the biggest “voice” when they don’t and can’t speak for all Muslims. I personally object to a lot of the things they say, and it irks me that they have\ managed to associate themselves with me. It’s kind of like a radical feminist speaking for egalitarian feminists who have much saner views. But here’s the thing: why is it the responsibility of Muslims to beat up terrorists or publicly exclaim their disagreement with them? No one had to “take responsibility” for Andrew Joseph Stack III after he flew a plane into an IRS building in Texas, even though a lot of small government and anti-tax people might have sympathized with him had he not been a nutter. We don’t blame his neighbors for not noticing, or for creating an atmosphere where a criminal like him could be produced. The problem, I think, is conceptualizing Muslims in America as part of a single entity. It is perhaps easy to do right now because Islam is still a bit strange and “foreign,” and its practitioners have not been here for a long time in numbers. I don’t give terrorists or extremist Muslims any thought, and I don’t know a single person (outside of law enforcement or academia) who does. Extremists might be obsessed with their religious identity, but normal people simply aren’t. That’s why we would simply never identify ourselves with terrorists, and why it seems strange that we would have to distinguish ourselves from them, any more than Obama would have to distinguish himself from the Black Panthers or Bush would have to distinguish himself from the KKK. Ah, I just thought of another thing regarding groups like CAIR. They have as much of a voice as the media gives them. They can put out statements all they want, but a news organization has to be the one to publicize it or give them an interview. I don’t see why a group like CAIR should be consulted after a terrorist attack or attempt, because what can they possibly offer in terms of opinion or information? They idea that they can provide an official “Muslim view” plays into the idea that Muslims can be thought of as a single block of people in America, and I don’t think journalists realize yet how inaccurate that is. Hmm… I guess ‘moderation’ does depend on whose standards you apply. One – fairly significant – problem is the standards reportedly applied by Mohammed and the writers of the hadith, not to mention those very frequently applied by Islamic jurisprudence today. By these standards Muslims who deviate from strict religious obligation are not moderate but often called apostate (which can have fatal consequences). By the standards of, say, liberal democracies, those same Muslims who do deviate from their religious obligations are considered ‘moderate’.